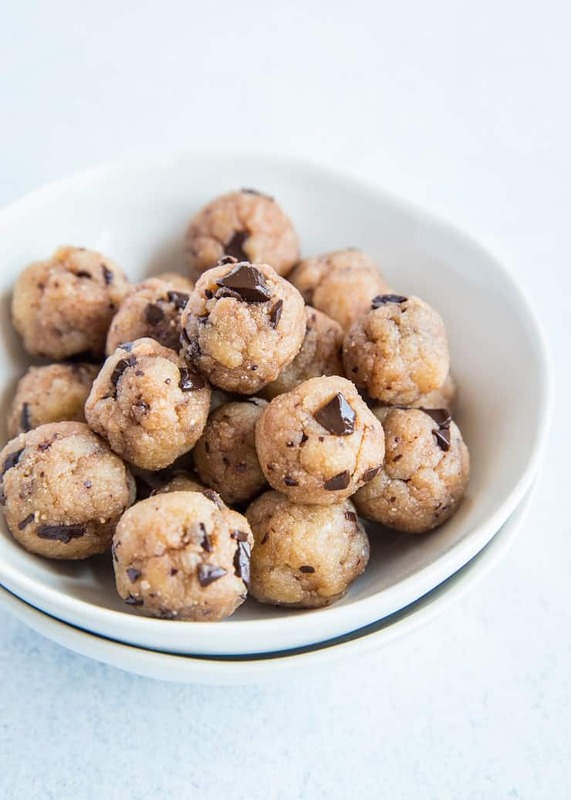 Grain-free, sugar-free, low-carb keto edible cookie dough. 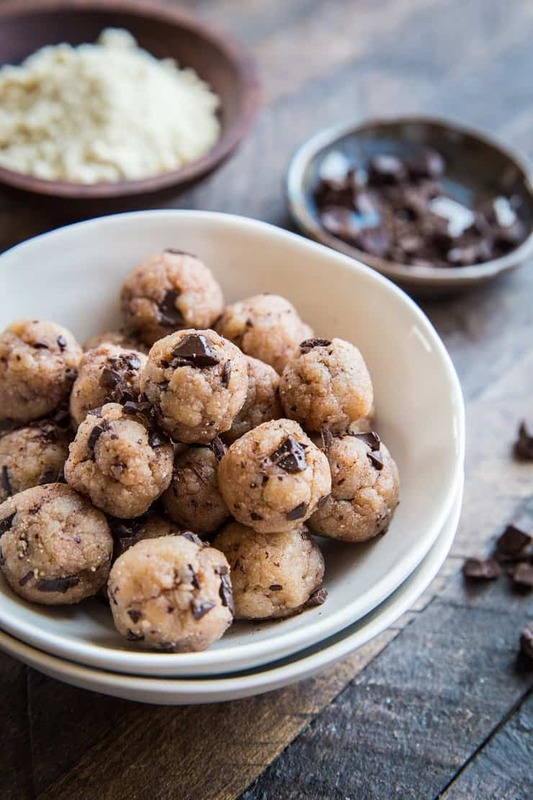 This vegan edible cookie dough recipe requires only a few ingredients and a few minutes to prepare!..Plus it’s a no-bake treat, so no need to fire up the oven! 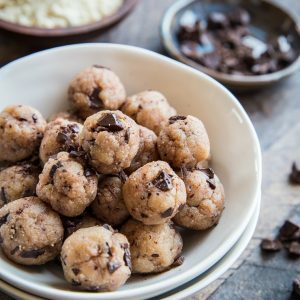 If you remember my Paleo Chocolate Chip Edible Cookie Dough, you’re familiar with the concept of the grain-free edible cookie dough. Well, we’re revisiting the topic to make a low-carb, sugar-free, dairy-free keto edible cookie dough that happens to also be vegan. Version 2.0 if you will! My original version of paleo edible chocolate chip cookie dough calls for ghee, but we’re swapping ghee for coconut butter to keep it dairy-free. We’re also trading out pure maple syrup for a zero-sugar sweetener to make it sugar-free and low-carb. 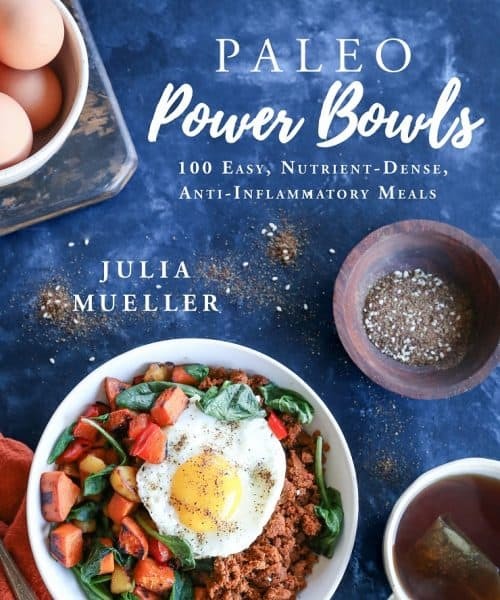 Hint: those of you who are neither vegan nor keto can absolutely follow the original recipe for a paleo version. We have a lot of options when it comes to the sweetener. You can use a granulated or powdered sweetener, like Swerve, Stevia, Monk Fruit Sweetener, etc., or you can use liquid Stevia. I’ve also been enjoying this organic maple flavored syrup, which is stevia-based and can be used as a 1:1 replacement for regular pure maple syrup (note: if you use this sweetener, use 3 tablespoons and cut the measurement of coconut butter back to 3 tablespoons). My preference is the maple-flavored syrup or Stevia drops (or any form of liquid zero-sugar) sweetener over the granulated type. Let’s discuss the chocolate chip portion of the recipe. To keep the recipe keto, you’ll want to go with a chocolate chip or chocolate bar sweetened with a zero-sugar sweetener. I like Lily’s Chocolate Chips for a vegan sugar-free chocolate chip option, but they do contain soy, so if you’re soy-free, a better option would be buying a sugar-free vegan chocolate bar and chopping it up. If you’re like me and you aren’t Keto, you can go with a Paleo chocolate bar. 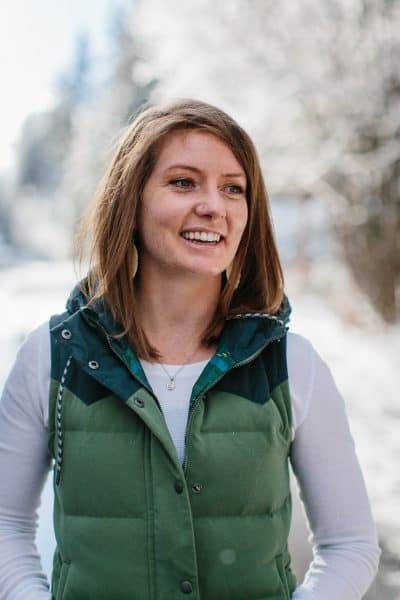 Eating Evolved, Hu Chocolate, and ZazuBean are my favorite paleo, vegan dark chocolate bars. Okay, so now that all that business is out of the way, let’s talk prep. You guys, this is silly simple to make. You just stir everything together in a bowl until it’s combined, and you’re done. You can either munch on your edible cookie dough right then and there, or roll it into little cookie dough bites (which is what I did, as you may have gathered). The dough is a bit greasy when you first make it, so if you are planning on rolling it into balls, you can refrigerate it first for an easier rolling experience. Whip up a batch of this edible cookie dough and use it in Keto Cookie Dough Ice Cream! Add all ingredients to a small bowl and stir until combined. Taste edible cookie dough for flavor and add more sweetener to taste. Note: If rolling dough into bite-sized balls, it's easiest to refrigerate the dough for 1 hour before rolling, but this is not mandatory. *I used Pyure's stevia-sweetened maple-flavored syrup. You can use a liquid sweetener sweetened with monk fruit, or use a granulated sugar-free sweetener. If using granulated, increase the coconut butter to 6 Tbsp and use 3 Tbsp granulated sweetener. If using Stevia drops, start with 3 drops and increase according to taste. **Use stevia-sweetened chocolate chips or chopped chocolate bar, or chop part of a paleo chocolate bar. If I’m allergic to almonds, is there a substitute? Try using tigernut flour. It’s a great almond flour substitute, but it’s not a nut, it’s a tuber – that has a nutty flavor! You should be able to sub 1:1 for this recipe. Hi Helen! I added the nutrition facts to the recipe card. I have the macros calculated based on 1 bite out of 16, assuming you’d be rolling the dough into 16 balls 😉 Let me know if you have any other questions. This recipe made me laugh just to know there are other cookie dough lovers out there. I love this recipe! There is hope now of me sticking to a Keto diet. Mygawsh, Brittany, it is soooo good! I hope you enjoy! 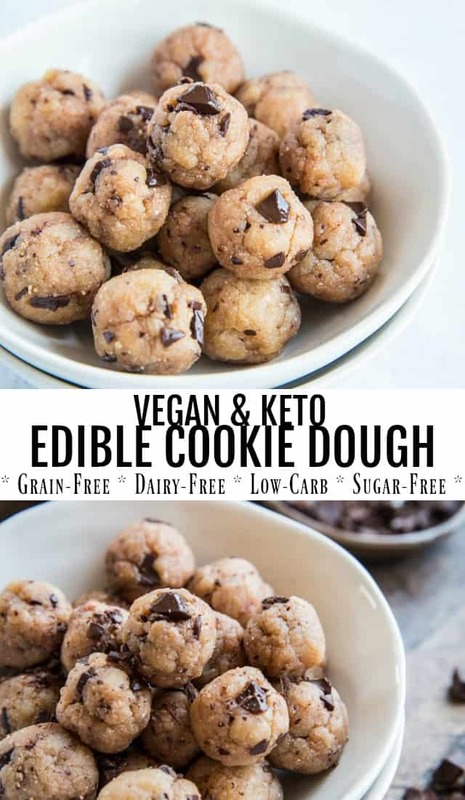 this cookie dough sounds great and already you have add nutrients ingridients but wecan add more nuts too..thanks for sharing this. Could I bake this for cookies, or would I need to add something? I am about to try the dough now first ! could i use coconut oil instead of coconut butter? thank you! !